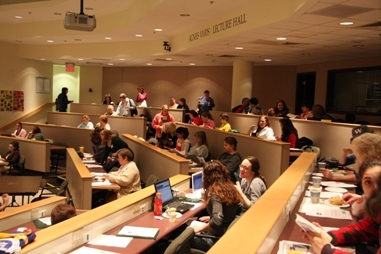 Massachusetts Animal Coalition (MAC) typically hosts meetings three times a year. Meetings feature guest speakers and are focused on issues and topics of interest to animal welfare professionals. Meetings also include an opportunity for members to update others about progress with their task forces. We promote vigorous discussion and positive interactions at all meetings for the benefit of animals across our state! Registration is open to members first at a special rate, and then open to non-members. Become a member now to save on future meetings! MAC ANNOUNCES THE 2019 ALL ABOUT DOGS! Sunday, June 9, 2019 – SAVE THE DATE! More details to follow. Meetings are generally held from 9 am until between 1 pm and 3 pm. Some sessions can run all day. Meetings are held at the Tufts Cummings School of Veterinary Medicine in Grafton, MA. Meeting costs vary for members ($20) and non-members ($30). The nature of some meetings may dictate a higher registration fee. Light breakfast and lunch are included. Take the Mass Pike to Exit 11 (Worcester/Millbury). At the bottom of the exit, go right onto Route 122 South toward Grafton. After 1.5 miles you will see a series of green highway signs for the Junction of 140 and 30. Take a left just before Statewide Glass. Follow road to its end and take a left. Go about 0.2 miles and take a right at the lights onto Route 30 East toward Westboro. You will reach Tufts in about 2 miles. Follow signs to Foster Small Animal Hospital. Once you have passed the hospital on your right, take a right. Do not enter the parking lot in front of the hospital. Take a right after the hospital entrance onto Willard Road. Pass the horse paddocks on the right and take a right onto Service Road. At crest of the hill, Varis Lecture Hall will be on your right in the back of Foster Small Animal Hospital. Turn left and park in the lot OR pass the hospital and park in the large lot on the right. (Please don’t park in the area behind the hospital.) Go in the back entrance of the hospital and you will enter the lobby of Varis Lecture Hall. Click here to get directions online. Note: it is Cummings School policy that animals are not to be left unattended in cars at any time. Learn the benefits of sponsoring a MAC meeting here. Please email info@massanimalcoalition.org if you have an idea for a speaker for a MAC meeting.